Top Five HOT Summer… Fragrances! Next up on my Summer lists are FIVE fragrances perfectly suited to long Summer days, balmy Summer evenings and not forgetting the odd rain downpour just to keep us on our toes. What makes a Summer fragrance? Well… obviously highly subjective but personally, I’m partial to a bit of greenery, a touch of juiciness, not too much of my beloved amber this time of year but a nice big blast of floral instead. I want a Summer fragrance to freshen and lighten my mood, I don’t want to curl up in it. I just want it to carry me along on a cool breeze. Don’t you DARE laugh. I’ve had this since I was 15 and I’m on my 3rd/4th bottle. I’m sure there are unwritten or maybe even written rules about fragrances not really being fragrances at all when you can buy them for £9 in Asda but I. DON’T. CARE. I think Tommy Girl is an exquisite Summer scent. It’s fruity and sharp without being tarte or acidic. It’s a proper mood lifter and whilst not hugely long-lasting (it’s an Eau de Cologne), it has a real energising tang with a soft, soft heart. A slightly more refined choice in the form of Miller Harris Citron Citron which is distinctly part fruit, part earth. It makes for a wonderfully new take on a traditional juicy fragrance. Yes, the Sicilian lemon is at the core of the scent but it’s flanked in all directions by a bouquet of wild herbs and woodland. Don’t mistake this for your typical juicy fruit fragrance… the fruit is nicely complemented with a crisp note of mint that ensures a perfect harmony. While Citron Citron shuns the juicier aspects of fruit… Burberry Summer holds its arms out for a fruity cuddle whilst secretly concealing a 3000 watt juicer. A sweet fragrance with a big hit of orange. It’s a touch syrupy but contains enough fresh, green notes to stop it from fading into the gourmand, fruit salad genre. Not the longest-lasting scent, it wears close to the skin once the top notes have faded and I detect a soft floral with a hint of powder. Burberry Summer is a carefree, Summer fragrance with youth on its side and if you love Nina Ricci-esque scents, you should definitely be checking this one out before the limited edition run disappears along with the last of Summer! Lemon peel, spearmint and pepper make for a zingy and uplifting opening to this deliciously light men’s fragrance. After a few minutes, the scent mellows, allowing the woodier notes to emerge. Vetiver, cedarwood and patchouli make for a smooth and creamy base which lingers for hours and keeps encouraging me in for another sniff. Despite having been created for men, there is nothing locker-room about this fragrance. It’s far more refined and if you’re keen on a little spice and some woody notes, it’s thoroughly suitable to wear as an interesting alternative to the standard female fare. I love it and it certainly doesn’t bring me the Lynx effect. Thank god! Currently available on the Floris London website at a knockdown price, Florissa is a charming floral with a heart of rose and muguet. I don’t wear lily of the valley too well but it reminds me of my Nan and will always hold a special place in my heart for that reason. The opening is sharp and a little overpowering, containing a delightfully crisp element of cut grass but the winner for me is in the soft, powdery floral qualities to be found from the drydown onward. It’s babysoft and comforting… Florissa is a perfume from another era and one that I happily visit again and again. I’m currently wearing Givenchy Absolutely Irrisistible Summer Cocktail which is a lovely summer fragrance, but don’t ask me to describe it, because I’m rubbish at that, lol. I need a new summer fragrance, too, but I think by the time I get around to picking one out, it’ll be fall again, haha. 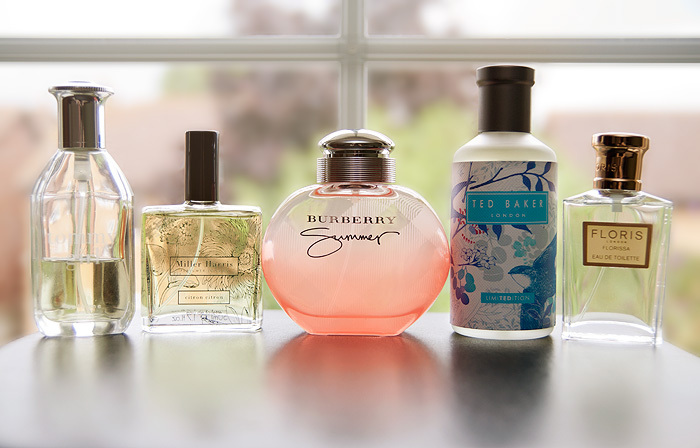 I’ve seen Burberry’s Summer on a lot of lists – I should go give that a try. loving the nine quid option!! OK, this is spooky – Citron Citron is my favourite summer fragrance (which no-one ever seems to have heard of! ), though often I make do with O de Lancome, which is a bit cheaper! Also love the O de l’Orangerie and O de l’Azur from Lancome. I wanna try a Lancome fragrance! Cuir de Lancome to be precise! Oh, you HAVE to try this! I have this, but it’s not (for me) a summer fragrance – definitely autumn and spring! Luca Turin, one of the most respected opinions in perfume, considers Tommy Girl a 5 star classic that is much overlooked simply because it’s price makes it unattractive to perfume snobs. So enjoy the heck out of it and wear it with pride! I’ve been looking for some summer recommendations. Thanks! Found you by searching for “summer fragrance turin”. I love it when this type of connection happens! Do you review perfumes often? It will be hard to find some place to sample these in the mid west of the U.S., but it’s nice to have an idea of what to look for. BTW, I have the O de Lancome too. It’s not bad, but not the cool breeze I’ve been looking for either. Cheers!